Tangrams are an ancient Chinese moving piece puzzle, consisting of 7 pieces made using 3 basic geometric shapes. There are two large, one medium and two small triangles, one square and one parallelogram. The objective of the puzzle is to form a specific shape (given only an outline or silhouette) using all seven pieces, which may not overlap. 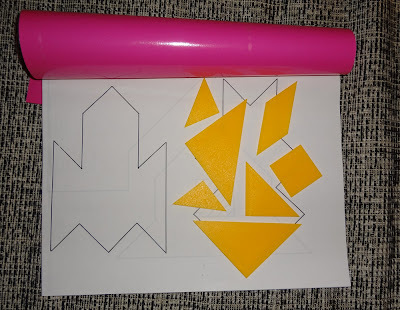 Search "tangrams" on google.com to find many other ideas and activities using tangrams.